You can now download iOS 11.3 For iPhone, iPad or iPod touch. The iOS 11.3 brought about new and exciting features. With the new update, you get to know how Apple uses your personal information and also when they want to access your personal information in order to personalize the iOS experience. Of course, you get to choose if you would like to continue or not. You also get a couple more animoji, four more to be exact; a lion, bear, dragon, and skull. The new iOS 11.3 also shows you your battery health and lets you know when your battery health is low and need servicing. Some bugs have also been squashed along with some performance improvement and OS stability. You can see the full features on the Apple Website. 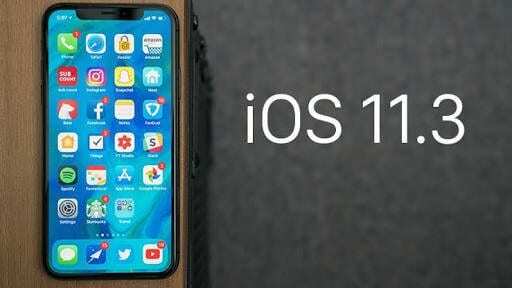 The best and easiest way to download iOS 11.3 for your iPhone, iPad or iPod touch will be to access Settings >> General >> Software Update. This will search for any available updates and you will be presented with the latest iOS 11.3 update. Click on “Download & Install” and the update should start Downloading after which it will subsequently Install. You can also update via iTunes but you will be needing a computer and USB cable for that. Also, you will need the IPSW files hosted by Apple for your iPhone, iPad or iPod touch. Below are the links for each. Please, make sure you are downloading the correct IPSW file for your device. How To Cancel Your Free Trial Of Apple News+ So You Don’t Get Charged $9.99? How To Trust An App On The iPhone? Once you’ve Downloaded the appropriate update IPSW file for your device then you can go ahead and update via iTunes. To do that follow the steps below. Connect your iPhone, iPad or iPod Touch to Your Mac or Windows PC. Open iTunes(Make sure it’s the latest version) and Select your device. If you’re using Mac, Press and Hold “Options” and then Select Update. On windows, Press and Hold Shift and Select Update. Your iOS device will update and you’re good to go. You should be able to download iOS 11.3 easily using the Software Update in the Settings Menu/App. Updating through iTunes isn’t that easy but isn’t difficult either. You have to choice which you prefer and go for it. If you run into any trouble while updating or have any questions about the iOS 11.3, you can simply drop a comment down below.